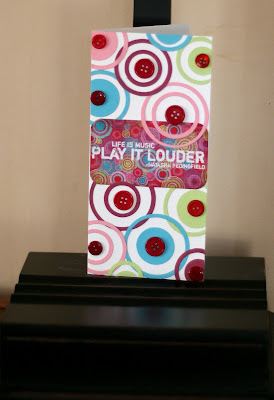 In honor of AllyScraps month long contest, "AllyScraps Next Top Scrapbooker", I decided to delve into the world of fashion and scrapbooking and see how they intermingle! Fashion dictates trends (or do the trends dictate fashion? which came first, the chicken or the egg? - that is for you to decide! LOL!) From handbags and home decor to scrapbooking, many of the products you love to hoard are inspired by the fashions that strutted down the runway at New York Fashion week (or some other fashion show). Based on this year's fall fashion watch we can expect to see lots of fun "new" trends and the reemergence of some old trends. 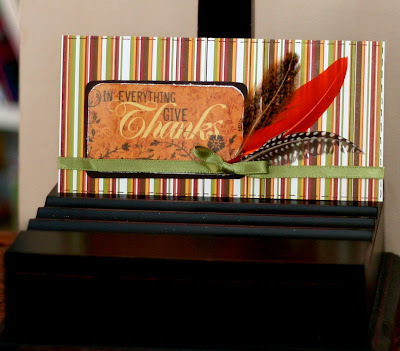 Architectural forms, country/western, feathers, goth and the color purple are all are "in"! - So, watch your favorite scrapbook store for some of these influences in the next few months! Trend #3 - The Dark Knight - Think goth. dark colors, metals, hard edges. 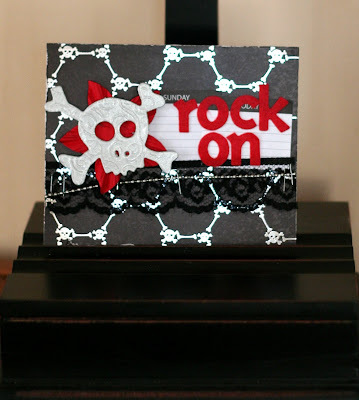 I made this "Rock on" card using lace, metal chain and a skull painted silver. Trend #4 - Go Western! - Fringe, rope, leather and country patterns are in! 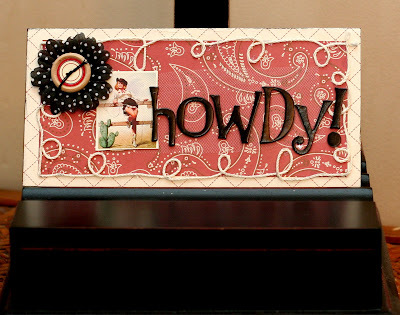 - I took advantage of this new trend and turned a "hi" card into a "howdy" card. Feeling inspired by fashion now? Go check out the article on Elle's website and challenge yourself to be a fashion forward scrapbooker! (and don't forget to watch for these trends in your favorite local online store - like AllyScraps of course!). and if you need more fashion inspired challenges (and games to boot) go check out the "AllyScraps Next Top Scrapbooker" contest at www.allyscraps.com . One lucky participant may be choosen to join our Design Team! Those cards are amazing! Thanks for the great tip on finding inspiration. Those cards are awesome. Great takes on the trends.